With 20th Century Women, acclaimed filmmaker Mike Mills (the Academy Award-winning Beginners) brings us a richly multilayered, funny, heart-stirring celebration of the complexities of women, family, time and the connections we search for our whole lives. It is a film that keeps redefining itself as it goes along, shifting with its characters as they navigate the pivotal summer of 1979. Set in Santa Barbara, the film follows Dorothea Fields (Annette Bening), a determined single mother in her mid-50s who is raising her adolescent son, Jamie (newcomer Lucas Jade Zumann, in a breakout performance) at a moment brimming with cultural change and rebellion. Dorothea enlists the help of two younger women in Jamie’s upbringing -- via Abbie (Greta Gerwig), a free-spirited punk artist living as a boarder in the Fields’ home, and Julie (Elle Fanning), a savvy and provocative teenage neighbor. 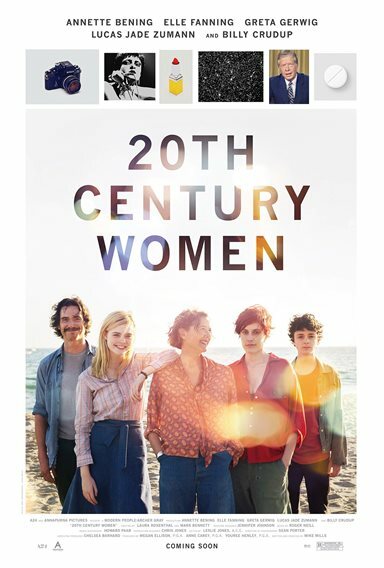 Download 20th Century Women in Digital HD from the iTunes store. 20th Century Women images are © A24. All Rights Reserved. When I heard about 20th Century Women, I was intrigued. People said it was funny and it got very strong reviews. It had a great cast, so I added it to my "must watch" list but took my time to see it. Now that it is coming to Blu-ray, it's time to revisit the film and write down my thoughts. Interestingly, I'm not completely sure what my thoughts about this film really are. There is so much to it I'm not sure exactly where to begin. The first thought that pops into my mind is existential. These people are free spirits in 1979 and draw the audience into their journey to self-exploration. Dorothea (Annette Bening; American Beauty) is an "older" single mom raising a 15-year-old son. She is pretty liberal and open but has had a hard time connecting to Jamie (Lucas Jade Zumann; Sinister 2) lately. Jamie is your typical 15-year-old boy who is full of hormones and pines after his oldest friend, 17-year-old Julie (Elle Fanning; Live by Night). Julie is the teen rebelling against her psychotherapist mom and who is sexually active with almost any boy besides Jamie. Add into this mix Abbie (Greta Gerwig; Jackie) and William (Billy Crudup; Jackie), two individuals who rent rooms in Dorothea's house. Jamie complains his mom is guarded and doesn't share her feelings. Dorothea asks Julie, Abbie, and William to help since Jamie seems to be shutting her out. However, I'm not sure that is the best idea, as William doesn't know how to connect with people, Julie is the person who keeps rejecting Jamie and Abbie is all about feminism and the punk scene. Through it all, these people become sort of a very warped version of a family only to disintegrate a few years later and lose touch with each other. Part of why this script works is the cast. They work so well together that the dialogue makes sense and the scenes feel as intimate as they should. The only time it was awkward was Abby and William's make-out scene, but I'm pretty sure that was intentional. Bening is terrific and Zumann and she have an easiness about them. Fanning plays these bad girls often but her ethereal nature offsets the things she says and does. Gerwig and Crudup transform themselves into these characters that are so vastly different than the people they were in last year's Jackie. Director and writer Mike Mills (Beginners) draws on personal experience to create these characters and the plot, which is why the film has such sense of familiarity about it. Anyone who grew up in the 1970's either knew people like Dorothea, Abbie, and William or were them or Jamie. We can relate to the cultural shift that happened at the end of 70's and these people represent this time frame so well. The script is smart and insightful which is part of what draws the audience in. The Blu-ray is presented in 1080p video with a 2.39:1 aspect ratio. The colors are somewhat muted at times but, again, I'm fairly certain that was intentional. The picture quality is clear though, with no muddled shots. The DTS-HD Master Audio 5.1 is sharp and the mix is good. It highlights the eclectic musical soundtrack beautifully. 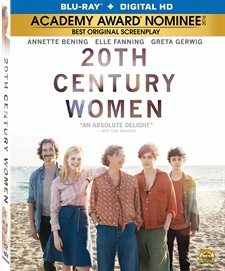 There are only a few extras on the disc, including audio commentary with Mike Mills, Making 20th Century Women and 20th Century cast. The former two are insightful and, as mentioned, discusses how these characters and events are based on Mills personal experiences and the latter talks about casting and what each actor brought to the role. While few in number, the extras are rich in content and worth viewing. Just like the late 70's, Mills makes 20th Century Women thought provoking while still making it interesting. One of the better films of 2016 in a year of excellent movies, this one is definitely worthy of your time.